Hello I lost my files on my sdcard, I don’t know how, but I want a program or app to recover my videos-images! I can’t put sdcard on pc, only I can connect phone with pc. help please. SD card (or memory card) is still one of the most favorite features for Android users even though big internal memory is already common nowadays. In order to release internal space, many people fill SD card with a large amount of photos and videos, which are often lost due to deletion, SD card corruption or unknown error while moving files. 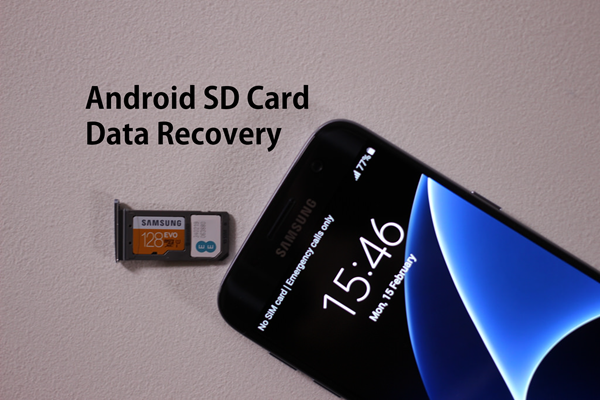 As a result, just like internal memory data recovery, Android SD card data recovery is also troubling users. In this article, we are going to talk about how to undelete photos, videos and more files from SD card on Android device without backup. Is Android SD/Memory Card Recovery Possible? You may still wonder whether you can get back deleted files from Android memory card. The good news is that it is absolutely possible. However, under two situations. Firstly, you need a good SD card recovery software for Android mobile. Secondly, you should stop using or saving new data to the SD card to protect the deleted files from being overwritten. It would be extremely easy to recover deleted files from Android SD card if the two conditions are satisfied. iReparo Android Data Recovery can retrieve deleted or lost data from SD card on Android phone as well as Android internal memory. It supports Samsung, HTC, Motorola, Nexus, Sony and other mobile phone running on Android 2.1 to 7.0. If you want to restore deleted pictures and videos from SD card on Android, please keep the memory card in your phone and use this program to do the recovery. If you have a memory card reader, you can also try Android SD Card Photo Recovery. It supports camera pictures, images, screenshots, video clips, movies and other media files. You can set format options to filter files on SD card before scanning to save time. You can preview all recoverable photos and videos before recovery. You can selectively recover files to computer and import them to your phone. Step 1. Install and run iReparo Android Data Recovery on computer. Step 2. Select Multimedia (including photo, video and audio) for recovery. Step 3. Select file formats for recovery. Step 4. Connect phone to PC and follow onscreen instruction for identification. Step 5. 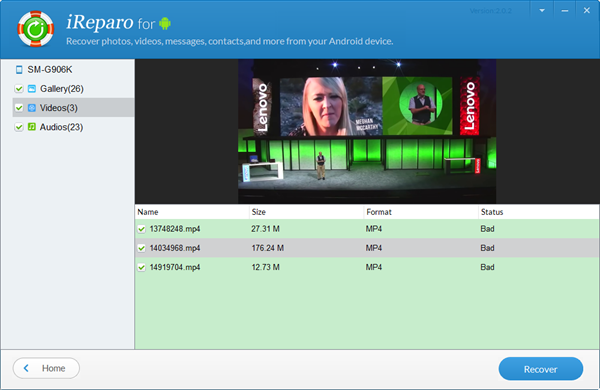 Preview and Recover video and photo files from Android SD card. 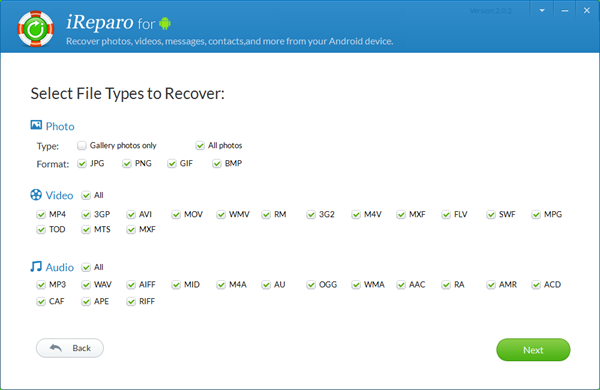 As you can see, iReparo Android Data Recovery can also recover deleted audio files on Android SD card, and all recoverable photo, video and audio files can be viewed or displayed before recovery so that you can get back the files you really want. In addition, this program can recover deleted contacts, messages, WhatsApp, etc. from Android internal memory and SIM card.